Can’t get enough of that sun and sand? Many colleges in coastal states such as California, Florida, New Jersey, and even Rhode Island offer quick access to some of the nation’s finest beaches. Whether you’re a surfer, a tanner or a sandcastle builder, you’ll want to check out these beach colleges. When choosing a college, the strength of its academic programs and its ability to play a meaningful role in your career goals should be the most important factors. That said, location does matter. If you're going to live somewhere for four years, it should be a place that makes you happy. Eckerd sits right on the coast of Tampa Bay in St. Petersburg, Florida, allowing easy access to several area beaches. The college also has its own on-campus beach, South Beach, offering a variety of recreational activities for students. Endicott’s oceanfront campus in Beverly, Massachusetts, just 20 miles north of Boston, includes three private beaches nestled in the coves of the Salem Sound. These beaches are exclusively for student use and conveniently located across the street from the main portion of campus. A smaller private college in historic St. Augustine, Florida, Flagler is minutes from the Atlantic coast and several beaches, including Vilano Beach, a local “best-kept secret” beach just a few miles from downtown St. Augustine, and Anastasia State Park, a protected bird sanctuary and public recreation area with five miles of beaches. Florida Tech is a technical research university in Melbourne, Florida, on the Atlantic coast. It is just across the Intracoastal Waterway from the small beach town of Indiatlantic and several miles north of the Sebastian Inlet, widely recognized as one of the best surfing beaches on the East Coast and one of the state’s most popular beaches. Mitchell College is located in New London, Connecticut between the Thames River and the Long Island Sound, giving students access not only to the college’s small private beach but also to New London’s 50-acre Ocean Beach Park, which includes a white sugar sand beach that National Geographic has rated among the best beaches. New Jersey might not top the list of places you would think to look for a beach college, but Monmouth University in West Long Branch is located less than a mile from the infamous ‘Jersey shore,’ offering easy access to local beaches such as the Seven Presidents’ Oceanfront Park, a popular New Jersey destination for swimming, surfing and sun. Palm Beach Atlantic University in West Palm Beach, Florida is just across the Intracoastal Waterway from some of the Palm Beach area’s best public beaches, including Midtown Beach and Lake Worth Municipal Beach. The university is also several miles north of the John D. Macarthur Beach State Park, an 11,000-acre barrier island park offering a number of nature activities such as hiking, snorkeling and scuba. Pepperdine’s 830-acre campus overlooking the Pacific in Malibu, California is just a few minutes from some of California’s most popular beaches. Malibu Lagoon State Beach, only a five-minute walk from campus, is considered one of the premier surfing beaches in the state, and Zuma Beach a few minutes down the coast is one of the largest and most popular beaches in Los Angeles County. Texas A&M Galveston is just a few miles from East Beach, the largest beach in the state located on the eastern tip of the island, as well as several other beaches in the Galveston area, a popular Texas beach destination. Considered one of the "Public Ivies" with a consistent top-ten ranking among American public universities, UCSD is also a prime beach school, located in the luxurious La Jolla coastal area. Local favorite Torrey Pines State Beach, just a few miles north of UCSD, sits at the base of picturesque 300-foot sandstone cliffs. 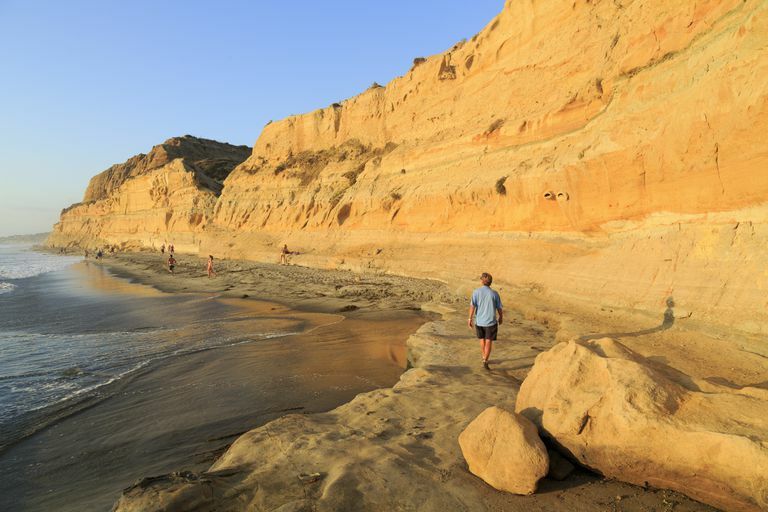 A section of Torrey Pines State Beach, known as Black’s Beach, is famous as one of the largest clothing-optional beaches in the country, although the city-owned portion of the beach prohibits this practice. As well as ranking among the nation’s top public universities, UCSB’s 1,000-acre campus is bordered by the Pacific Ocean on three sides and sits adjacent to Goleta Beach, a primarily man-made beach and a popular area for sunbathing and fishing, as well as Isla Vista, a beach-front college-town community within Santa Barbara and a prime surfing spot. UC Santa Cruz sits overlooking Monterey Bay along the central coast of California. It’s just a short trip to several popular Bay Area beaches in Santa Cruz, including the city-run Cowell Beach and Natural Bridges State Beach, a California state park area that features a famous natural rock arch over a section of the beach. UH at Manoa is nestled in the hills just outside of Honolulu on the coast of the island of Oahu. The university is just minutes from many of Hawaii’s famous white sand beaches, including Waikiki Beach and Ala Moana Beach Park, which offer year-round swimming, surfing, snorkeling and other activities. UNC Wilmington is within traveling distance of several of North Carolina’s beachfront communities, most notably Wrightsville Beach, one of the barrier islands on the Cape Fear Coast of the Atlantic. Just a few miles from campus, Wrightsville Beach is a mellow beach community and a popular destination for vacations and water sports.